I wish I had read one of my favorite books, "All the Light You Cannot See," by Anthony Doerr, before I visited St. Malo in 2012. I would have been on the hunt for all the spots mentioned in this story of a young blind woman living in this seaside French town during the Occupation, who became involved with the Resistance in her own way. Alas, I didn't. But I thought I would share a few sights from the town to help give it a sense of place in the minds of those who have already read the book and those who have yet to discover it. The original town was founded in the first century by the Gauls. By the fifth century, Celts fleeing instability in Britain added to the population. The modern town was traced to a monastic settlement founded in the early sixth century and named after a presumed follower of Brendan the Navigator, St. Malo (aka Maclou), one of the seven founding saints of Brittainy. We arrived in the evening after a long and rainy day that included a visit to St. James American Cemetery and Le Mont St. Michel. We had been soaked, had tired feet and were hungry, so we headed to a cafe. All three of us ordered the Plat which is the special. And wine. It was a chicken dish and delicious. And so was the dessert! We didn't have a hotel reservation, either, but we were able to find a spot. I post the photo below only so you don't end up there! Every now and then one should sleep in the beds to be rented out. Just saying! The following morning found us up and walking through the cobbled streets of the old walled city. Much of St. Malo was decimated in the WWII bombing and a large part of it is reconstructed. The villains were not the Nazis, but the Americans and British who mistook the town for a Nazi stronghold. (The town was occupied by the Germans.) Napalm was used here for the first time by the Americans and it took twelve years to rebuild the city, stone by stone. We found a cute cafe for breakfast and savored omelettes before heading off to see more of the city. The town is the birthplace of Francois-Rene, vicomte de Chateaubriand, a French writer, historian and diplomat who is considered the founder of Romanticism in French literature (thank you, Wikipedia!). Of course he is recognized in the city. Jacques Cartier, the founder of another favorite walled city of mine, Vieux Quebec, the older part of Quebec City, was born and set sail for the new world from here as well. For the best views in town, head to the ramparts, which were built (or started) in the twelfth century. The city had a long history of piracy and one can visually see how it may have been ideally situated for this. You can walk out to the old fort. Rick and Jerry did this. She who trips over her own feet on a good day elected to stay high above and take pictures! Because, some days, brains win out over desire! It was pretty much destroyed during the war. Excellent graphics tell the story. And the stained glass is exquisite. I loved this town, and why not? Any place that had a street named Rue du Chat Qui Dance (which Wikipedia translates as "Cat Street Dancing") is fine by me. And they also seem aware of the pitfalls of canines, too! This post is part of Paris in July. 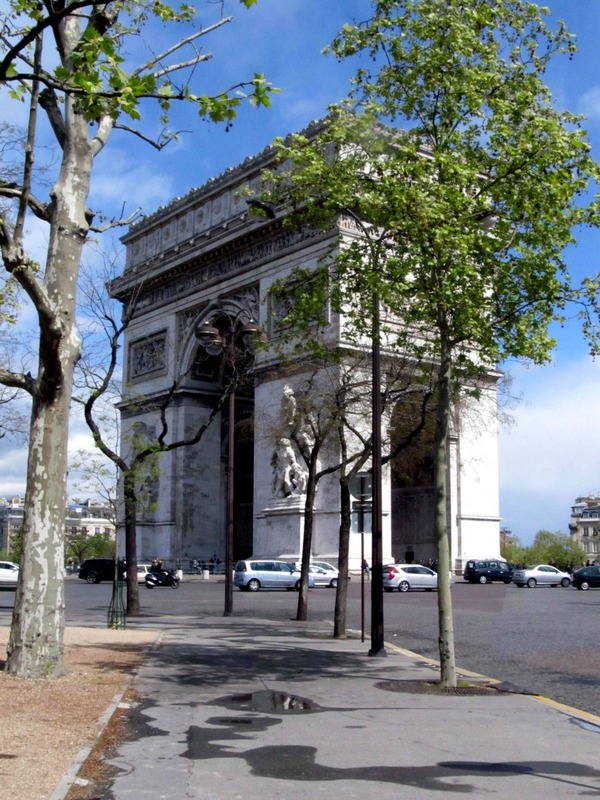 Visit here for more links related to Paris and France. And, feel free to join in on the fun with your own France-related posts! 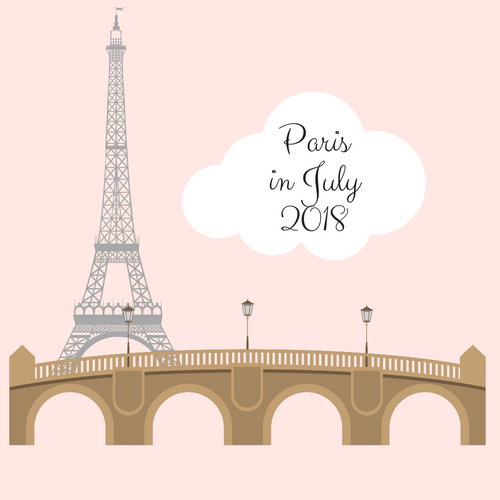 Paris In July -- Please Join In! 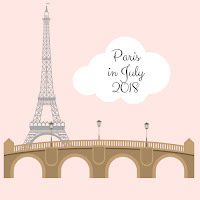 One of my favorite blog events each year is Paris in July, which Tamara from Thyme for Tea hosts. During this period, we write a weekly post connected to something related to France (not just Paris, despite the name). It could be a book or film, photography or travel, a review of a restaurant -- anything! Check Tamara's blog for details. Posts begin on July 1 and the event runs throughout the month. You may do one or more each week, depending on how Parisian you feel or skip a week or two! My mind is already spinning. My favorite books about Paris and France? My best French recipe? Revisiting a few photos? The possibilities are endless! We closed up the cottage last September, leaving it (we thought) clean enough. But that first trip up always reveals the bit of sand that wasn't swept and plenty of dust! Rick couldn't get up with me until we go for the Fourth but I went up for a couple of days to clean. And clean I did. Mopping and vacuuming. Putting on screens and raking pine needles. Changing linens and fixing the toilet. (Yes, I did. I bought the part and put it in all by myself! Pat on back!) But it wasn't all work! There was time to read. Time for some wonderful long walks and chatting with neighbors, meeting new ones. Time for a swim and time to sit quietly and watch the Duckster Family swim by. Mom and seven babies! Time to make friends with the inside birds as well! No time for drawing or painting, but I did put the beach towels to good use! Lizzie was in her element, too, enjoying the screened in porch. I finally found the July issue of Country Sampler magazine (I'd been looking all over downstate and found it at the grocery up north!). Our blog friend Judy of Gold Country Cottage is the cover story! I loved this page because it had a photo of Judy and her husband Jerry and now I know who I'm "talking" with when we comment back and forth! 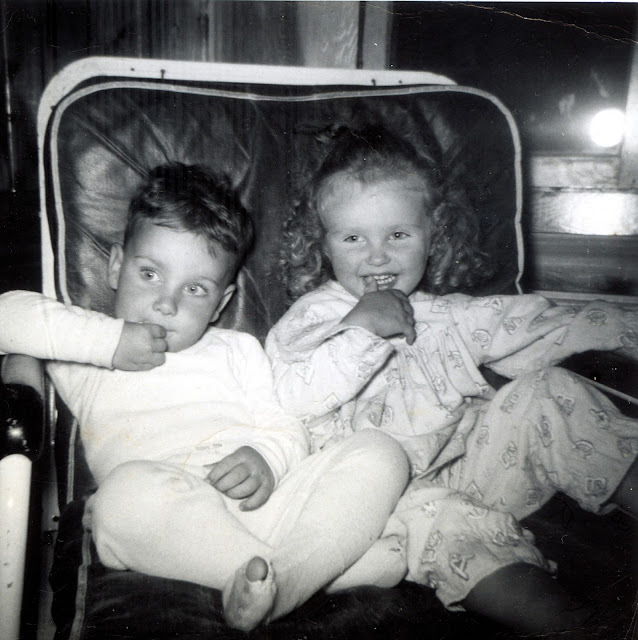 An extra surprise was another feature with a blogger I visit, Carol from Art and Sand. (I am so wild about her blue and white and husband's paintings!) You are both inspirations to me! Perhaps the best part of my short visit was spending time with my cousin David. 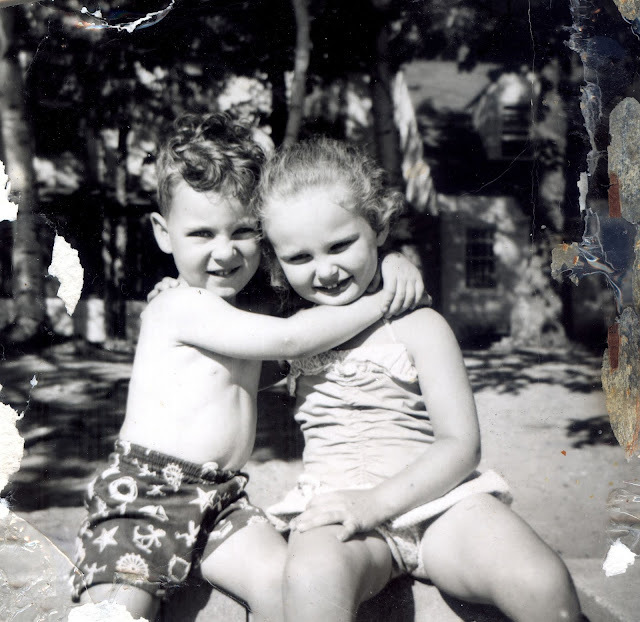 This is David and I at the lake back "in the day." We spent years growing up at the lake together in the summers. It couldn't have been better! Just like old times -- only, well, older! The Blogger Fix -- If You Can Call It That. You may notice that I am now moderating comments on this blog and they don't appear until I OK them. Some of you are old hands at this. UPDATE: Now, for some reason, I do not have to moderate and I'm still getting your email notifications so the fix below worked. So, you can skip to the part that says "Keep Calm and Carry On. But I hate it. For several reasons. First, contrary to popular opinion, I don't live on the computer. And the comment doesn't post till I OK it. But if I am overbooked, overstressed or (as I will be for part of the summer) in the Land of Limited Internet, I may not see that comment for a few days. It looks like the comment didn't go through (as David asked in an earlier post -- thank you, David, for caring enough to ask!). So, one might leave another comment. Or just bail on me altogether. It makes it particularly challenging if you are hitting the road and pre-scheduling posts but not able to see comments. So, why am I doing what I don't want to do? Because this blog is on Blogger and Blogger is completely screwed up in terms of email notifications. If you're a Blogger blogger, you know what I mean and if you're not, just know I'm moderating and forget the rest of this (and count your blessings!). So, if you've not figured it out yet, here's how can you get the email notifications sent to you. 1) Go to settings/posts, comments and sharing and first switch to moderate. 2) While there, erase your address from the address box and hit save. 3) Retype your address in the box and hit save again. You will get an invitation (maybe two) from blogger to see comments. Accept it (them). OK -- so NOW you periodically have to check in comments (left hand side) "Awaiting moderation" and you'll see a bunch. Click that little box at the top of all of them (which blocks all) or each individually and hit publish. They will be published on your blog and you will get an email. If they are a blogger with an email address listed, you will see their address. Otherwise, they'll be no-reply blogger. I'm hoping blogger fixes it back to the way it was originally. There's still talk of that on the blogger help page. But I'm not terribly optimistic. What I don't understand was that it wasn't broken so why did they try to "fix" it? Anyway, that's how I'm getting the comments in the mail. Good luck, no matter what you do. And now, I think I need a break before I pull all my hair out. I see such magnificent gardens on your blogs, I'm always embarrassed to share mine! But all the rain has made for good growth and the color is coming on! The lettuce got in late so it isn't huge but it's sweet and perfect for adding to sandwiches. And finally, BBT's -- bacon, basil and tomato sandwiches. The store tomatoes are nothing to write home about but when these begin to bear fruit, yum! Pretty much all of my gardening is in pots and they don't look great all mixed up in front of the house but some of these are going to the cottage with me when I hit the road for the lake. I'll take my herb basket and some basil for sure. I'm a sucker for herbs and the dill self seeded into the ground from last year's pots so now it's quite a fluffy collection! My book club friend Laura split her agapanthus plants and mine is blooming! It's so pretty and I'm hoping I can winter it inside without instant death. On the side of the house, a thyme and oregano garden and some climbing roses. The zinnias I've planted are just seedlings now, but that green stuff behind the roses is mint. Wonderful mint! Some of you asked where I was going to put the HUGE sun face from my Southern Exposure project. It's so heavy, I can't hang it on the house or fence so right now, what you see is what you get! Here's one of the more recent Southern Exposure projects, the Log Planter. It's coming along well, too. And so is the bird planter I did there earlier this season. I do love those projects; they give back all season long! In front, the sweet peas are coming on. Pretty soon this bush will be like Audrey Two in "Little Shop of Horrors" -- all fabulous pink and white sweet peas. And so are the lilies. The iris and bleeding hearts are gone but I have some Baby Grand sized chairs there, just because they make me happy! I am quite sure the pansies will fade out when the weather gets consistently hot but for now, I love them! So there you have it -- the early garden ventures in my world. I'm looking forward to seeing yours! What Do You Love and Hate About Where You Live?